Selling for £495 at launch in the UK back in 2007, this was the Japanese cartridge specialist’s cheapest pickup ever, and although benefiting from designer Jonathon Carr’s tremendous experience, was not entirely hand built by Lyra’s artisan Yoshinori Mishima. Instead, the initial build was subcontracted out. It was also the first to use a Namiki MicroRidge line-contact stylus, but was wound with the customary ‘6 nines’ OFC copper wire. The suspension was also tuned for high traceability, reflecting the use that such a ‘budget’ product is likely to see. It had no pole pieces, the magnetic field being created by two symmetrical disc magnets, which allowed the coils and cantilever to move more freely. The skeletal body was machined from a single piece of aluminium alloy for rigidity, then hard-anodised, and its shape was designed to minimise the presence of conductive materials in the vicinity of the magnetic gap and signal generator coils. There were no subcarriers, making for the most direct mechanical connection between the boron cantilever and the motor, for the best possible energy transfer. Signal output pins were rhodium plated, not for sonic reasons but for those of durability. Jonathon Carr believed that it lasts far longer than gold plate. The Dorian’s most obvious European rival was the Ortofon Rondo Bronze, a cartridge of which I have much experience. As such, it was fascinating to hear them both in my system to make comparisons. What soon became obvious is that they’re two very different beasts, going for two very different markets – and the fact that this is supposed to be Lyra’s most entry level, ‘user friendly’ design to date says much about the rest of Lyra’s range. 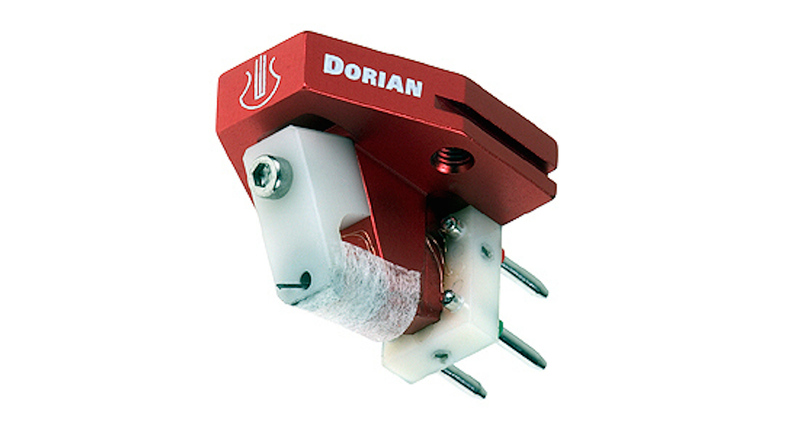 The first thing that you notice about the Dorian is its ultra explicit sound, even at the maximum recommended 2g tracking force. It is both lightning-fast – in a way that makes the already excellent Rondo Bronze sound positively soporific – and also rather bright. Measurements confirmed a strongly rising high treble response, and you can never ignore this, but given the right ancillaries you can work around it, and enjoy the Dorian’s giant killing abilities. Isaac Hayes’ Café Regio displayed dizzying amounts of detail, and a deliciously finely etched – if a tad sharp – hi hat sound. I’ve never heard any mid-price MC deliver such a fast, gripping presentation, with razor-sharp attack transients and superb dynamics. By comparison the Rondo Bronze sounds ponderous and rather uncommitted. Bass, if not exactly prodigious, was full and dynamic, starting and stopping as fast as almost anything I’d heard. Running it against a van den Hul Frog and Koetsu Red K Signature simply confirmed the Lyra’s brilliantly incisive, detailed and dynamic sound (the other two sounded woolly and out-of-focus by comparision) – but also its toppy treble. Electronic music such as Kraftwerk’s Computer Welt was also a joy through the Dorian, sounding massively energetic and musically engaging, whilst the classic eighties rock strains of REM’s Maps and Legends had it unearthing massive amounts of detail across an impressively wide and deep soundstage, whilst hanging it together in a wonderfully musical way. It lacks the romance of the pricier Koetsu, or the smoothness of the similarly priced Ortofon, but boy can it eke out information from the groove! In this respect, it’s remarkable at the price. It is certainly ‘brightly lit’, which becomes overly apparent when playing LPs with poor surfaces (it shouts out snap, crackles and pops from the rooftops), but with a smooth system and/or turntable it was a revelation for its price.